So much to post about…but so little energy to do it. 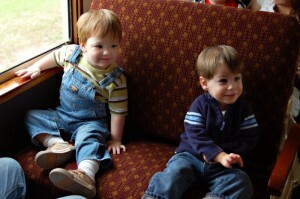 Basically – we are a wee bit baby-centric these days. We are praying (and would LOVE it if you did too) that this baby comes in the next couple of weeks after an uneventful, SHORT and yet beautiful laboring/birthing experience. We are as ready as we could ever be, so bring on the baby! I was home with Jack today because of an appointment this morning and other scheduling issues. We had a wonderful time and I just wanted to share a funny moment from the day. Jack was in the bathroom, ehem, taking care of business so to speak when I hear, “Diego, go sit in time out.” Confused, I went into the bathroom to see that Jack was comforatably sitting on the potty reading his book with Diego sitting on the stool next to him in “time out.” No word as of yet as to what poor Diego actually did to deserve such harsh punishment. My guess is he didn’t obey Mommy Jack. If you look closely, Diego looks like he has his arms up as if being held at gunpoint. Poor, poor Diego! I hope he learned his lesson. 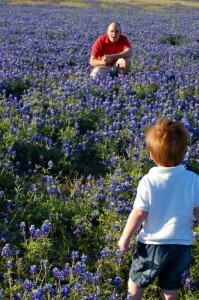 One really amazing thing about a Texas spring time are the amazing bluebonnets! 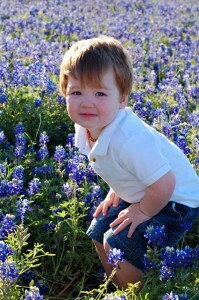 We were lucky enough to find a gorgeous patch here in Richardson this weekend and took Jack out to try and snap some pics. 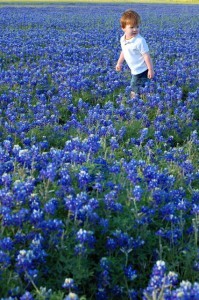 At first he was quite freaked out to walk through the flowers as they were well above his knees in some areas. 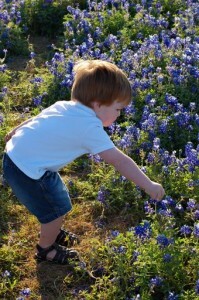 We finally hooked him by getting him to look for lady bugs! Despite the harsh light, we managed to get some good shots of our sweet boy. 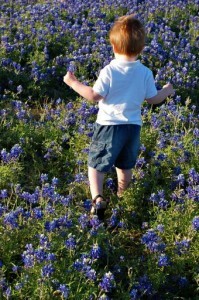 My little law breaker…picking the bluebonnets!! Shhh…don’t tell! 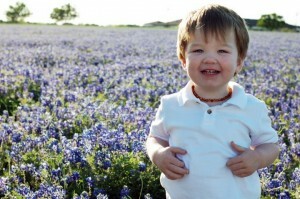 As I look at these pics of Jack I still have a hard time imagining how his life is about to change. I know he has no clue. I hope it is normal for me to be mourning his “only child-ness” right now. Not because we aren’t excited about the new baby, but because he truly has such a kind and loving heart and the thought of him, even for one second, feeling hurt just breaks my heart. 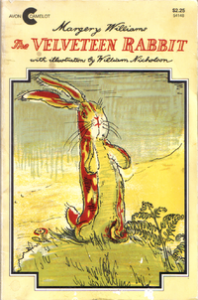 I know he will experience pain and hurt many times in his life and I cannot protect him from it; it is frankly just part of growing up – I just hate to know that I might be the cause of it this time. When can I stop holding my breath? So it has now been a full week since Jack has worn a diaper or so much as thought about going to the bathroom anywhere but the potty (it has been months since he has pooped in a diaper). Now I am wondering when I will stop being nervous when we are out in public. 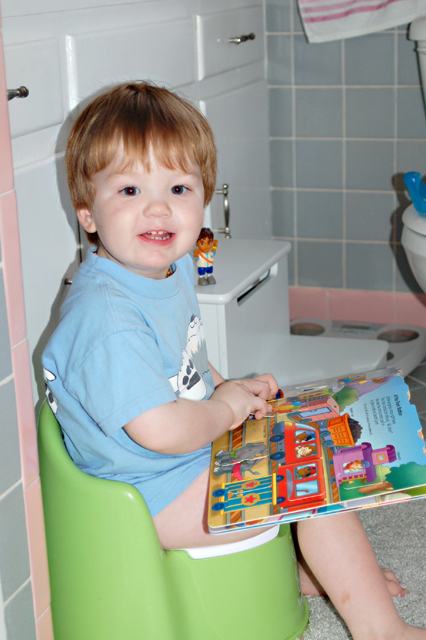 He still won’t go in a “big potty” unless he is at home on his seat we place on the toilet. We did buy a fold up seat for him to sit on the big potties but he is still convinced he will fall in and thus F.R.E.A.K.S. out when we try. We have his “car potty” that he has used a few times in an emergency but public pottying is still a struggle. So, we never venture too far from home for too long as a result. I do have cloth training pants that I put him in, but those just help contain the wetness a little, he still gets plenty wet; it just doesn’t flow everywhere like it would if he were in just regular underwear. I still don’t want to rush my expectations of him, but it is hard to not get too excited and I really do want to trust him completely. We still do mostly naked at home so he can go when he needs to without having to ask for help pulling his pants down etc. Mornings are becoming much less of a struggle because he knows if he wants to watch a TV show (Thomas is the latest MUST in the mornings) then he has to go potty first. Before he would just hold it (after holding it ALL night) and throw a bloody fit when asked to go. The coolest part is seeing that he really GETS it. He gets that he is a big boy and doesn’t wear diapers anymore and he is really proud of it! Please keep praying that this lasts and that we won’t experience any regression when the baby is born! For Jack at least! I am hoping to have about a month off from diaper changing and laundry and it looks like I might actually be granted that! I think it is funny that this decision to be done started with Jack asserting his independance and me actually trying to fight him on it. No, I wasn’t trying to get him to stay in diapers, but I was trying to tell him when and where to go to the bathroom. So, in doing this, he thinks he wins and I know I win! 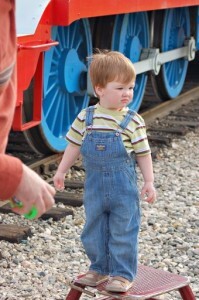 If he wants to be a big boy, by golly, I am not going to stand in his way! We are on Day 6 of him being totally dry (even NIGHT TIME!). He has been much more cooperative with going when he needs to. I think I am just learning that he has a much stronger bladder than I give him credit for. As long as he goes every few hours, I am ok with that…just not the 8 hour stunt that he pulled the other day! I am so proud of him! I am also hoping that if we have a solid month under our belt that we won’t experience any regression after the baby is born. I wanted to sing a little song and do a little dance as I did one last load of diapers, cleared out his diaper cabinet and packed away any salvageable ones for baby #2. Then I got to stuff all the new baby’s diapers and stock the cabinet with new, soft, clean, fluff!! I really didn’t think we would get to this point before Baby M came, but God is in control of everything…even potty training!! He knew my desires and was kind enough to grant this to me (and Jack of course)! Right? That’s what I think of too. Totally freaked me out! 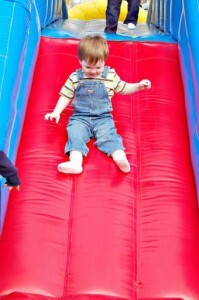 I was shocked as all get out when I heard that diagnosis last night at the pediatric urgent care place. Jack had been battling a fever all day that hovered around 102.5 and really didn’t seem to respond to tylenol or anything. However about 7pm it spiked at almost 105. He has had a strange rash that has come and gone for a couple of weeks now, but there has been NO fever associated with it. Sometimes it has seemed to bother him and other times, he hasn’t seemed to noticed. 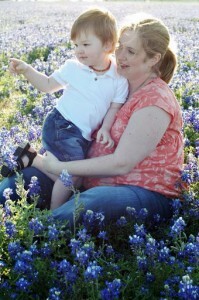 His pedeatrician assumed it was some type of allergic reaction because there was no fever associated with it. It later started to look and feel like eczima. But yesterday morning Jack woke up with a fever around 102 so we kept him home. He was up and down some, but really slept most of the day. His fever got down to 100 at one point, but that is all. Apparently Scarlet fever is caused by the same bacteria that causes strep throat, but he doesn’t have strep throat, just the rash. The part that I don’t get is that the usual symptoms are 1) fever 2) rash. Well, that is not at all the order it went in with Jack. Also the doctor’s wishy, washy diagnosis “I’m just gonna call it Scarlet Fever” didn’t really give me much confidence. Regardless, we are going to give him the round of antibiotics and hope that the doctor was right. Since he has his Mommy and Daddy’s ‘oh-so-stable’ intestinal track I am also upping his probiotics to not mess with this poor body any more that we have to. I am at work today and Alan is at home. He says that Jack ate a hearty breakfast and is happily dancing around the living room to Seseame Street! Let’s pray that lasts! Whew, this was a very busy weekend. Hopefully the last for a while. 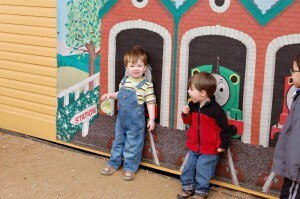 The highlight was taking Jack to see Thomas the Tank Engine on Saturday morning out in Grapevine. We parked in remote parking and took a shuttle to the main gate. 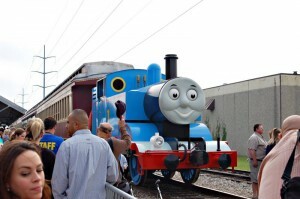 We happened to be sitting at the front of the shuttle and the instant that Jack caught sight of Thomas he let out a VERY loud shriek of “THOMAAAAAASSSS!!!!! 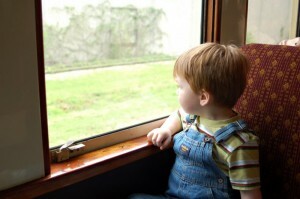 !” Every kid on the shuttle freaked out. It was so funny! 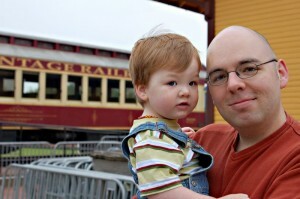 We got to ride on an old historic train and Jack just loved it! We met up with the some friends so Jack had a buddy to share this awesome time with. 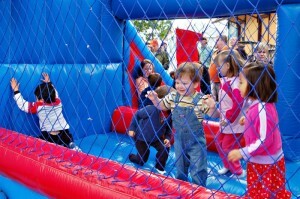 This was Jack’s first time in a bounce house…I was taking bets on having to either leave him there forever or take the bounce house home with us, because I wasn’t sure how we were going to get him out. We did…he survived! Later that afternoon my Cousin, Dana, Sister, Anna and best friend, Gina threw me a cloth diaper shower. I will post about it and put pics on the baby blog of that. Sunday we had the egg hunt at church, which is always tons of fun. Kerri is amazing for always working so hard to make it so fun for the kids! Unfortunately it was really sunny and I was super tired, so my pics kinda stink from that…but rest assured, Jack had fun! Needless to say, I am BEAT today!